the one next door, or even your own house may be rat-infested. It never hurts to check. The more of these you note, the more rats you’re likely to find. As a matter of fact, your pets may already know they’re around if you’ve witnessed them perking up their ears at sounds you don’t notice, and sniffing at smells your nose can’t detect. The first thing that may spring to mind when you think of rat infestation is rat bites, but although, it can’t be ruled out, rats are shy animals more likely to run from, rather than toward you. They’re more likely to cause harm through the diseases they transmit, either directly, by contaminating food with urine or droppings, or indirectly, by leaving behind fleas and mites to bite you and your children. 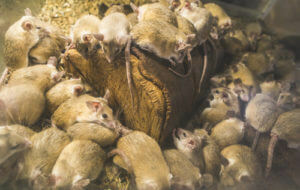 Listeria, hantavirus, hemorrhagic fever, leptospirosis, salmonellosis, and plague are a few of the more than 35 diseases that have been attributed to rats. Rats pose a danger to your home. Blessed with sharp teeth, at least from their point of view, they think nothing of gnawing through wood, plastic, wallboard, plaster, even electrical wiring. This last is perhaps the more severe because, although the others result in structural damage, electric wires stripped of their insulation can cause shorts in the circuitry or even start an electrical fire. As is the case with most problems, the best defense is prevention. All it takes is a phone call to Critter Control® Southwest Florida, and our trained technicians will take over, using their knowledge of rat behavior to remove rat infestations and prevent future ones from occurring. Call us today for a free consultation at (941) 584-4703.